Statistics state that approximately 8% of resolutioners only achieve their goal by year end. That leaves 92% of you currently failing to finish what you started. Why does this happen? last an initial few weeks but too much change all at once can take its toll on your system both physically and mentally. Set small intermittent goals and allow yourself a realistic time line to achieve them. Habits do not develop overnight therefore if the expectation is to go from doing nothing to doing everything all at once the outcome will be less than desirable as you have not allowed your system to adapt and evolve to such changes that may be foreign to it. Setbacks are inevitable. No one is 100% of the time. The difference between those that succeed and those that do not, is how and IF you dust yourself off when you stumble. This begins with setting realistic expectations. By telling yourself you are ‘never going to cheat’ on your diet , skip a day in the gym, have that extra nibble, have not so good days, is only setting yourself up for disappointment. 9 x out of 10 one of these will happen along the way. Often we become so consumed with being ‘perfect’ that when we aren’t we become defeated with guilt. This guilt equates to a sense of disappointment and therefore an internal challenge as to whether we feel we deserve or are worthy of this journey. Remember you cannot change what happened 5 minutes ago…..but you can change what happens 5 minutes from now. *you do not need to be affiliated with Adrenaline prior to this challenge. Open to EVERYONE- MALE AND FEMALE. A. Check In: Should you choose to want an initial check in it can be arranged with your designated trainer prior to start date. This will include initial photos and measurements/weigh ins. We train for a look NOT a number therefore the emphasis of this challenge will not solely be based on physical transformation. Final check in will be completed last week of challenge. B. Challenge Group Training: scheduled bi-weekly Saturdays at 8:15am to 9am. Although not mandatory it is encouraged that you attend. We would love to have you there. 3. Add On additional Options to assist in achieving your goals. 30 minutes of non-stop PUSH. Conditioning focused class utilizing a variety of training tools including kettle bells, Trx, battling ropes, tires, prowlers, sleds, Body weight, indoors and outdoors and best of all the 'dreaded white board'. Forget turning your wheels on a dread mill--- you were not born a hamster!!! Unlike our popular Fidelity Ladies Only Strength class. 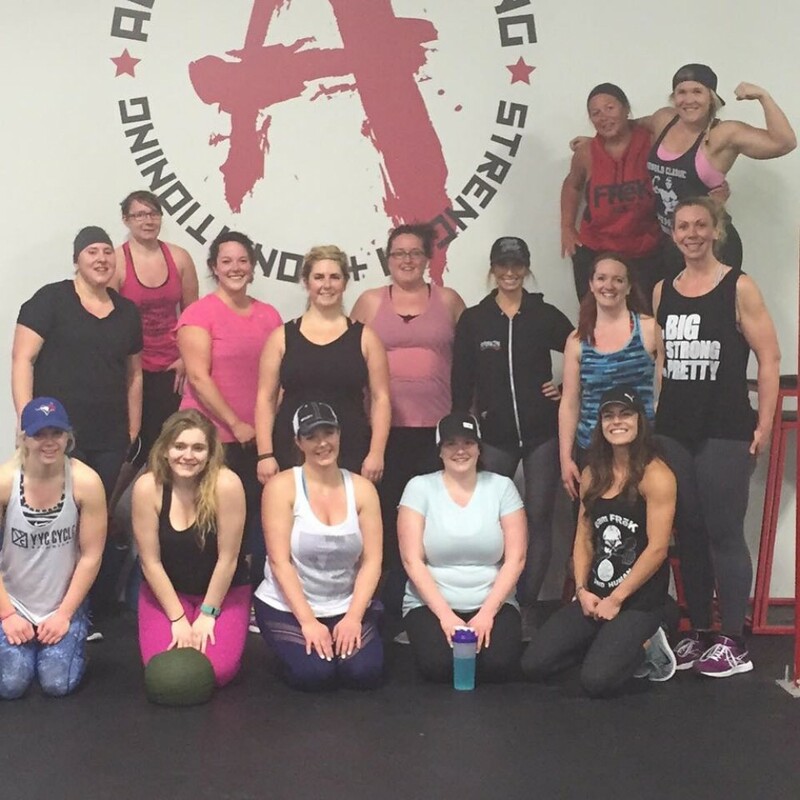 This class focuses on training movements instead of muscle groups. Strength is a skill. If you want to increase your squat, deadlift, bench-press, overhead press you have to practice those movements to perfect them. Each class begins with some basic movement prep before getting right into the lifts. This class is a slow paced lifting class that follows a periodized training program. We write everyone's working weights on the white board so lifters can get on top of their warm-ups and lifts while the instructor makes the rounds monitoring everyone's training. Although you are training with other people the goal is not to compete against them, the goal is to compete against yourself and crush some PR's at the end of the program. This class is open to men and women of any skill level. *Trainer selections will be based on availability. Although we will do our best to meet your request, each trainer does have set schedules throughout the week and will only be available to train in those allotted time slots. It is recommended that your training time slot be as consistent throughout the 12 weeks as possible. If you prefer to be with a certain trainer, please contact them or Adrenaline prior to registering to ensure availability. *Who says meals can't be fast, easy and delicious? Learn how to do a basic meal prep including making 1 breakfast, 2 dinners and a snack (that's not a cheat). We will go over shopping, prepping and when we're done there will be leftovers to take home. *12-week membership including 24-hour access. There is nothing more rewarding then taking back control of your own success. BUT it wouldn’t be a challenge without a little incentive…. The group participants themselves through a private poll will vote this on.